Luca Di Montezemolo is an iconic figure in motorsport and Italian public life, for his many great achievements, for his charisma, and for the theatre with which he conducted himself. His problem was that in recent years the play was not very good and the acting had gone stale. Di Montezemolo has done great things with the road-car side of Ferrari's business. Their current range is arguably the best they have ever had, and the company is poised to announce record financial figures. But Ferrari's brand image rests to a large degree on its involvement in Formula 1, and there the company is in serious trouble. Despite having Fernando Alonso, the greatest driver of the era, in one of their cars, the F1 team has been slipping backwards since the last time they won a world title in 2008. Alonso has carried the team on his back, masking their shortcomings with his incredible commitment and consistency and the sheer quality of his performances. Somehow, Alonso came within touching distance of two world titles in 2010 and 2012, despite the inferiority of Ferrari's car. But this year even he cannot make their performance look acceptable. Two podium finishes is all they have to show for 13 races of unstinting effort. Their worst year since the dark days of the early 1990s has brought things to a head. Di Montezemolo cannot escape responsibility for this decline, for all his success with Ferrari's road cars, or the reputation he built up in organising the Italia '90 World Cup, and as team principal in the 1970s rebuilding Ferrari from another low into the dominant force it became with Niki Lauda from 1975-7. The fact is, Di Montezemolo had come to be seen as part of the problem - as Fiat CEO Sergio Marchionne, who will take over as Ferrari president, hinted on Wednesday. "Our mutual desire to see Ferrari achieve its true potential on track has led to misunderstandings," Marchionne said of Di Montezemolo in the wake of his 'resignation'. When it became clear in recent days and weeks that time was running out for Di Montezemolo, a source close to the team remarked sardonically: "Finally, Ferrari has a chance to sort itself out." This year, it has all gone wrong for Di Montezemolo. After backing the new hybrid regulations in F1 before the season started, confident in the mistaken belief they would enable Ferrari to become competitive again, he then criticised them when Ferrari's failings became apparent. He turned up at the Bahrain Grand Prix to bemoan the new "taxi-driving" F1, only for the drivers to put on the best race in years. But it was a race in which Ferrari had only a bit part. Alonso and his team-mate Kimi Raikkonen struggled to hold on in the frantic battle for the final podium position behind the two Mercedes drivers. Time and again, the Ferrari's lack of power was exposed, as Mercedes-engined cars blasted past the red ones on the straight. In the Ferrari pit, an exasperated Di Montezemolo glowered at then-team principal Stefano Domenicali before throwing up his arms and storming off before the end of the race. It is said that when he and Domenicali got back to base in Maranello, Di Montezemolo demanded the head of the boss of the engine department, Luca Marmorini. Domenicali refused, offering his own resignation instead. With that, Ferrari lost the chance to sign the architect of Mercedes' dominant power unit, as Domenicali had been in advanced talks with the German company's engine boss Andy Cowell, who then got cold feet. If Cowell was put off by the blame culture at Ferrari, he is not the only one. At least two other senior engineers from other teams have decided against joining this year for that very reason. Marmorini went anyway, sacked later in the summer. Meanwhile, rumours that either former Mercedes team principal Ross Brawn, or their former technical director Bob Bell, could join the team continue to rumble, as they have done all year. The impression is of a team in chaos, just as it was in the early 1990s before Brawn, Jean Todt and Michael Schumacher arrived, presaging a period of dominance the like of which the sport had never seen before. There are signs of hope, though. Domenicali's replacement, Marco Mattiacci, is quietly making a good impression among senior figures in F1 as a man who means business and looks like he can deliver. Mattiacci, it is said, has decided to back the team's new technical director James Allison to the hilt as the Englishman seeks to sort out the mess of the engineering department while inevitably fighting the politics doing so brings with it. And Marchionne is a hard-nosed industrial manager who gets things done. But the big question is what effect Di Montezemolo's departure will have on Alonso. The two-time world champion was already considering his future with the team. He has a contract until 2016, but McLaren are desperately trying to persuade him to join them in their new era with Honda engines, and want him as soon as they can get him, either next year or, more likely, for 2016. Alonso spent an hour with Di Montezemolo at Maranello on Monday, presumably picking over the bones of an Italian Grand Prix that was even worse for Ferrari than that of Bahrain. But forget any claims you hear that Alonso has lost an ally in Di Montezemolo. In fact, they did not get on at all - and that is putting it mildly. All the hugs in the garage, the urban handshakes in the paddock, were for show - just like Di Montezemolo's trips to the Monza pit wall to wave at the fans, when in fact the grandstand was half-empty and responded hardly at all. That scene, played out on Saturday morning, seemed to be a perfect metaphor for Di Montezemolo's fall. He gave a defiant news conference, even if what he said was not exactly the denial it was presented to be. But the writing was on the wall. And four days later, he is gone. An era is over, an era in which Ferrari dragged itself out of the doldrums only to slip inexorably back into them again. 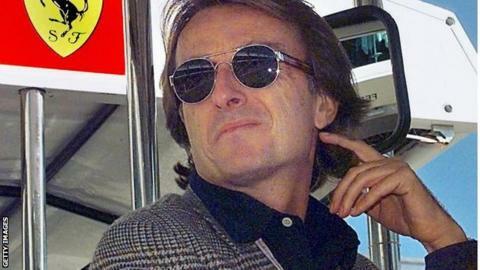 For that, Di Montezemolo has been held accountable. Charismatic and engaging figure though he was, his time was up. And he has left his successors with an awful lot to do.